Baylor moved up four places in the latest "Best Colleges" rankings released in September by U.S.News &amp; World Report. At No. 75, Baylor is the third-highest ranked university in the Big 12, behind only the University of Texas at No. 45 and Texas A&amp;M at No. 58. Baylor is the fifth-ranked university in Texas, behind Rice, UT-Austin, Texas A&amp;M and SMU. Other Big 12 universities that were ranked included Missouri at No. 90, Iowa State at No. 97, Kansas and Oklahoma at No. 101, Oklahoma State at No. 132, Kansas State at No. 143 and Texas Tech at No. 160. U.S. News also gave high marks to Baylor's engineering and business undergraduate programs. Baylor's engineering program came in at No. 13 among universities with the "Best Undergraduate Engineering Programs." The category is for schools whose highest engineering degree offered is a bachelor's or master's degree. However, Baylor will soon begin offering a research-oriented doctoral program in electrical and computer engineering. Baylor's undergraduate business program in the Hankamer School of Business is tied with 11 other universities at No. 69 in this year's rankings by U.S. News. Baylor's entrepreneurship program -- which was one of the first of its kind in the country -- jumped to No. 11 among the nation's best entrepreneurship programs. Baylor also was ranked No. 51 in the High School Counselor Rankings, in which guidance counselors from all the high schools in U.S. News' 2010 Best High Schools rankings, as well as from the largest private independent schools nationwide, were surveyed. Baylor was one of only 19 universities nationwide to receive an "A" from the American Council of Trustees and Alumni (ACTA) in the 2011-12 "What Will They Learn?" report, which gauges an institution's commitment to a strong core curriculum. The ACTA study looked at curriculum offerings at 1,007 major public and private colleges and universities in all 50 states. Baylor was on the 'A' list for the second year in a row. The grade is based on how many of the seven core subjects an institution requires. The subjects are: composition, U.S. government and history, economics, literature, math, science and foreign language at an intermediate level. In making the "A" list, Baylor ranked among the top 2 percent of colleges and universities nationwide. No other Big 12 institution made the list. Baylor was joined by schools such as Georgia, Pepperdine, Air Force and West Point. Baylor University was named on The Chronicle of Higher Education's 2011 Honor Roll as one of the country's "great colleges to work for." Only 30 national universities were awarded honor roll status. Baylor was among university standouts in four categories: leadership, compensation, careers, and the workplace. "This designation by The Chronicle of Higher Education informs the entire higher education community of something that those of us who serve at Baylor have long understood," said Dr. Elizabeth Davis, BBA '84, executive vice president and provost. "Baylor is a deeply rewarding place to work, filled with energetic and talented people who are inspired by the university's mission of combining academic excellence and Christian commitment within a caring community." For the sixth straight year, a best-selling college guide has named Baylor University a "Best Buy." 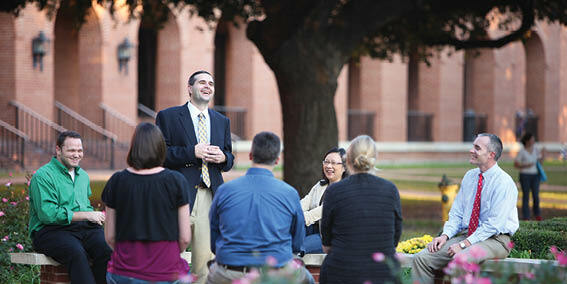 Baylor is one of only 43 public and private colleges and universities in the United States to earn the designation. The Fiske Guide to Colleges 2012 explores the academic climates and the social and extracurricular scenes at the "best and most interesting" schools in the United States, Canada and Great Britain. Its selections for "Best Buys" were based on the quality of the university's academic programs and campus experience in relation to the cost of attendance. "Now more than ever we know that students and families are seeking the best value for their investment in higher education," said Baylor President Ken Starr. "We are honored that the Fiske Guide has again recognized Baylor among a select group of universities in the country that provides an outstanding education value."